Shake 'N Bake is a packaged coating for chicken and other meats. The mixture adds crispiness and flavor to the meat before baking for a quick meal. The basic directions instruct users to dip the chicken or other meat into water before placing them in a bag of crumbs and shaking. The crumb coating comes flavored, but additional methods of spicing up the mixture adds variety to the baked meat. Try different seasonings and additions to experiment with your Shake 'N Bake modifications. 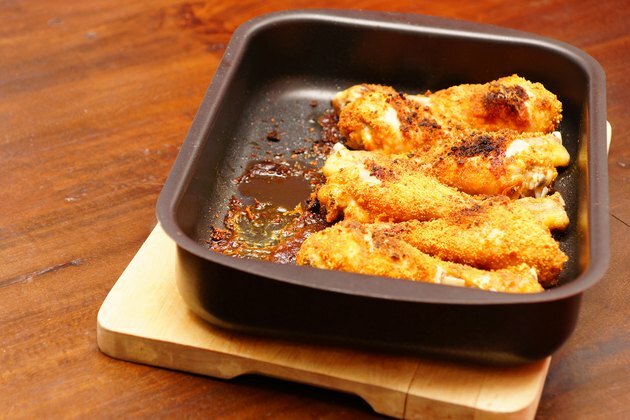 Marinate the chicken in your favorite marinade for at least an hour before dipping it into the crumbs. Pull the chicken out of the marinade, allowing the excess to drip off. Dip the meat into the crumbs as usual. Dip the chicken in barbecue sauce instead of the water that the package calls for. The barbecue sauce holds the crumbs onto the chicken while adding flavor. Other alternatives include egg white, mustard, buttermilk or ranch dressing. Stir in dry seasonings with the Shake 'N Bake crumbs before dipping the chicken. Add in ½ tsp. each of seasonings like oregano, cayenne pepper, garlic powder, cumin or chili powder for more flavor in the chicken coating. Add seasoned breadcrumbs to the Shake 'N Bake mix. This gives you more of the coating mixture so you can use more on each piece of chicken for a thicker coating. You also get the additional flavor from the seasoning in the breadcrumbs. Spritz the coated chicken pieces with olive oil or melted butter before baking. This helps crisp the crust and adds flavor to the meat. Sprinkle Parmesan cheese on top of the chicken before baking. Dip the meat in sauces like ranch dressing, barbecue sauce or honey mustard after the meat is cooked.